I keep trying to get braver with my drone and to test that I'm flying it over the lake more and more to try to take pictures. It's definitely a bit stressful because the wind seems to be more powerful over the water and I find it drifting from time to time while I'm trying to get the shots. But somehow I've kept it from going into the water so far, so hopefully I'll be able to avoid that fate. On Friday night, I drove down to Clear Lake, Iowa for the 2018 Cabin Classic Golf Tournament. It's named after Jason Alexander's cabin and the fact that's where we stay for the weekend. It was good to see the old gang again. Krazy Kory was even able to join us this year which definitely helped amp up the Kraziness Factor throughout the weekend. He usually has that kind of effect on things. All in all there were 13 of us golfing and we decided to go to the course in Sheffield, Iowa for the event. We did a 2 man best shot tournament and played in groups of 6 so I got to hang with these fellas for the day. Normally courses frown on sixsomes, but the course was pretty quiet while we were there. Kind of odd because it was an absolutely beautiful day. I think your ball went that way. This course has some unique features, but the thing that stands out the most is "The Ruins" in the middle of hole number 4. There used to be an old brick and tile company that had stood on this land and these remnants are leftovers from the kilns. They can be a pretty tough hazard to deal with if you get stuck in the middle of them. Your concentration can be broken pretty easily when the train comes barreling down the railroad tracks that run alongside the course. Nice flag, though. I tried to explain to Chris that he wasn't using this right, but he just kept smiling and going on with his business. At night, we like to relax and play some Texas Hold 'em tournaments. I even managed to win a couple of rounds this year which was a nice change of pace from the usual results. Chris broke the record for the largest stack of the evening so we had to deal with him rubbing that in our faces all night. 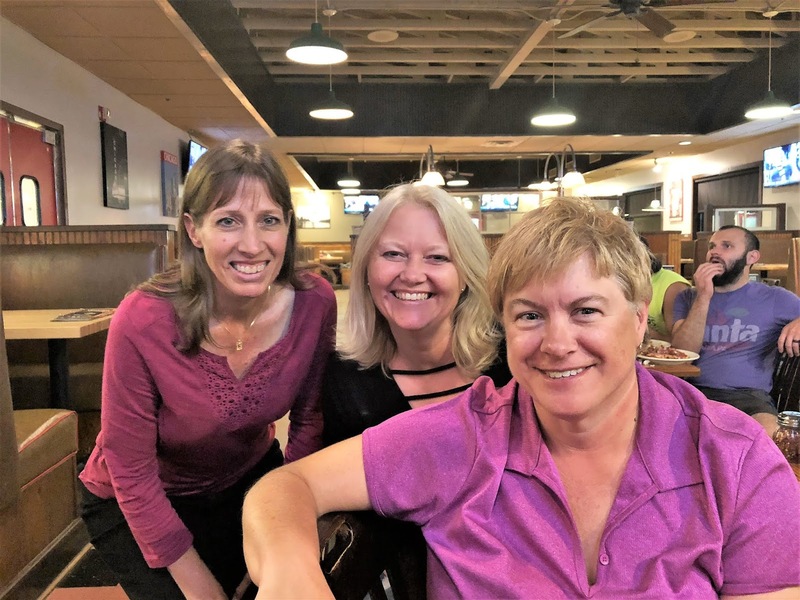 Miss Sheri had a fun week getting the chance to re-connect with her college friends again. It's always good to see these ladies!